Unfortunately we are too far to quote but we did try and guide him a little where to look and what to look for with regard to a resin garden path- see below. “Thanks for the email. Sorry no we don’t cover your area. We would not be in a position to quote in your area. 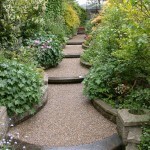 What you need to look for is resin bonded stone as opposed to resin bound stone. I don’t know if you are aware of the difference ? If your existing paths are a solid impermeable surface ( which concrete is) then you need a resurfacing product to that provides a further impermeable surface a permeable surface and a resin garden path in resin bonded aggregate would provide this. Basically if the existing is fine then you just need to protect it further. The resin bonded stone is impermeable and anti slip and virtually eliminates weeds (water can’t get down and weeds can’t get a grip). If you looked at the other option – resin bound paving ( or aggregates as it is also known) , then you need to be aware. This is permeable and therefore allows the ingress of water. The other quite important aspect is the depth of the layer of resin. Resin bound is trowelled on and should be applied to a 10 mm + depth which in turn can affect the existing levels. Resin bonded is spread on and then has the specialist aggregate applied and will not affect the existing levels. Back to your question – can we recommend any one? The short answer is no. However what we do say is that there are National Companies who train installers, however be aware that these seem to favour resin bound. That said, you will find that the installers should be trained in both applications. So bearing in mind the points above, you can put these comparisons to the companies and form your own opinion from there. The other thing to do is look locally and you will find that resin is in various shopping centres and on the local highways? I would contact the local shopping centres and ask who completed the works. Also contact your local highways/ council and you may will find that they will supply you with the details of the local contractors. They may well do residential and if not they may well know a man who does! 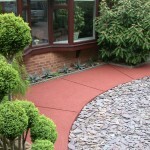 Whether it is a driveway path or patio, if it is concrete or tarmac we can resurface with resin bonded stone. No mess no disruption and just as importantly it can help eliminate weeds, moss and algae problems in addition it will provide an anti slip quality. This entry was posted on Tuesday, May 20th, 2014 at 7:28 am	and is filed under Concrete, Diary of a Mansfield Resin Driveway Company, gardens, Latest News, Mansfield, Paths, Resin Bonded Gravel, Resin bonded path, Resin Bound, Tarmac and Asphalt. You can follow any responses to this entry through the RSS 2.0 feed. Both comments and pings are currently closed.